For a band that flies under the self-proclaimed title of “gay church folk music,” Toronto’s The Hidden Cameras have earned that recognition with each step they've taken. At the intersection of gritty electro-clash and chamber music, it comes off as a creative but dull sixth album by the edgy music collective. 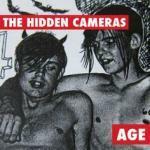 Age is the first new work by the Hidden Cameras since 2009’s Origin: Orphan, an album that also blended musical genres but was more of a concessive work than Age. Not to judge a band solely by their previous works. But Origin: Orphan had a more focused direction, where each song fell in place with each other. Danceable hits like Underage were perfectly balanced with the heavy-pop of Walk On. The problem with Age is that it feels unpolished and lacks direction, relying heavily on string instruments for most of the tracks, resulting in compositions that feel repetitive and lackluster. While a few upbeat tracks stand out, the rest of album feels flat and rather boring. Skin & Leather starts off with a colorless intro, a sort of string led take on a Depeche Mode track. It is nicely orchestrated but feels long and dragged out; only when the chorus kicks in does the track feel a bit poppy, but it’s too little too late. The lyrics of the track also leave little for the listener to enjoy, where frontman Joel Gibb just makes use of the song’s title as filler. It is followed by Bread for Brat, which is equally disappointing and is similar in scope to Age’s opener. Bread for Brat also makes use of repetitive lyrics like its predecessor, but has its short comings layered over a violin-based score that really leads nowhere. The obvious stand out is Gay Goth Scene, a track that follows more of the poppy fanfare that the band is known for. It starts off with another sustained string intro, but quickly turns into a sort of glam-pop anthem. The chorus makes for a good dance hit thanks to its upbeat and heavy drum work. Carpe Jugular is also a fairly good track, reminiscent to any late 80’s disco remake that would get your feet moving. Age has its promising moments, but it overall fails to hit the mark. Gibb’s songwriting this time around just doesn't match the range and energy of his previous works. The upbeat Gay Goth Scene wasn't enough to keep the album from derailing. For fans of the Hidden Cameras, it may simply come off as growing pains for the group, or perhaps I missed the whole point on disco chamber music.